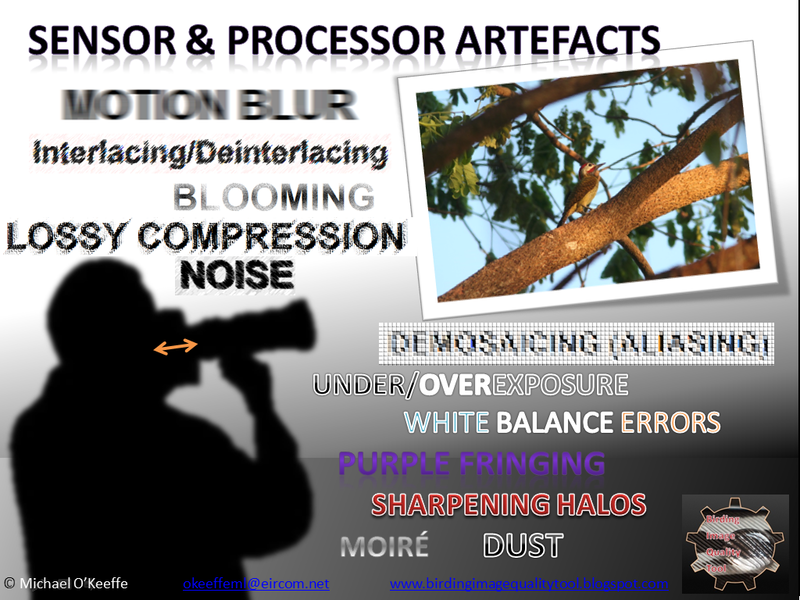 In a summary HERE I described an artefact as the distortion of an image. There are various environmental, optical and processing parameters which bend and distort the properties of an image in different ways. I was recently given an interesting puzzle by a member of a rarities committee. Photographs of a rare bird appeared to show colour-tinged fringes to a feather tract where one might not expect to see them. By contrast, another feather tract showed pure white fringes as expected. After some deliberation I concluded that the effect must be due to image saturation boost. It was only through saturation boost that the colour fringes had become apparent. In some of the captured images the saturation was boosted during processing, enhancing the colours. In others the images were more natural looking, and the fringes were so subtly coloured as to be virtually unnoticeable. The fringes did indeed have subtle colour in them, but interestingly this had not been recorded by the observers in the field. The immediate question becomes, well are these fringes really coloured or not, if after all they were not readily observable in life? An interesting perspective I think! I imagine that if this bird had been observed in the hand the fringes would have been rather more apparent, albeit still quite subtle. In the images where the colour saturation was boosted, so that they became prominent, one would have to describe their unnatural saturation boost as due to an image artefact. In other words, they were a distortion. 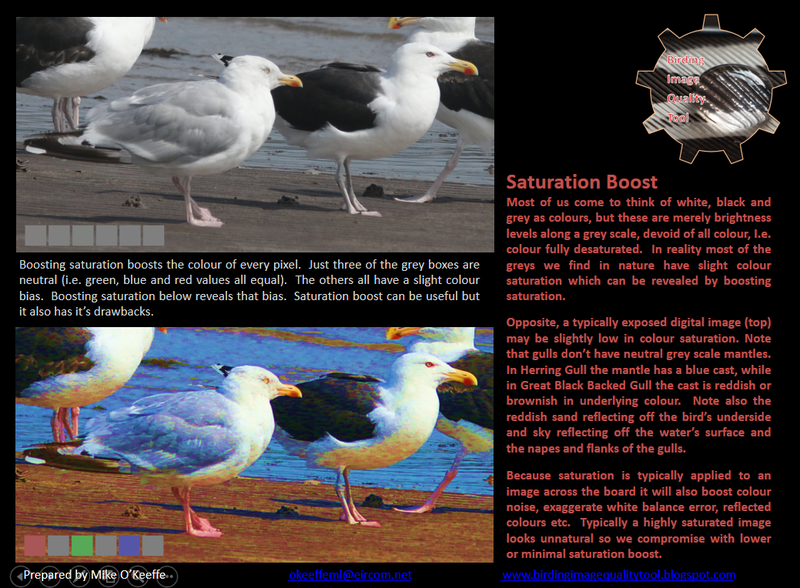 Saturation boost has it's pros and cons as I described in my posting HERE. One of the advantages is in being able to differentiate and name colours which may have become subdued due to lighting or environmental factors. But one has to be able to sort through the noise and understand exactly what is going on in a saturation-boosted image to interpret it correctly. What do I mean by this? 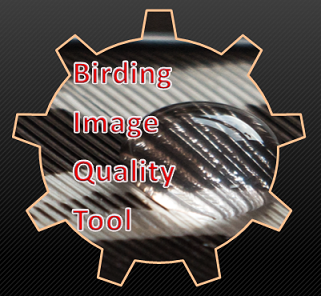 There are many image quality parameters which can leach or desaturate the colour from an image. Some of these can be described as artefacts, but not all. Moisture and dust for example can distort an image as it passes through the air by lowering contrast and saturation. These could be described as environmental artefacts. Glare from sunlight hitting the lens is another example. On the other hand, I wouldn't consider low-intensity light by itself as an artefact, because the image is formed from this light not distorted by it, if you get the distinction. But some of the image quality reduction caused directly by the camera's reduced ability to deal with insufficient light intensity could be termed artefacts (eg. noise, motion blur etc). There are also of course many natural forces which bleach colours naturally. 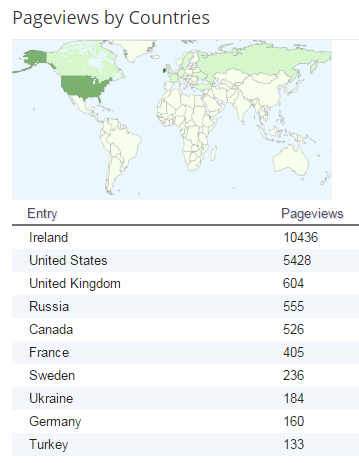 The images below help to illustrate these points. I believe these two images refer to the same individual tristis-type Chiffchaff. And yet, the colours appear quite different. Why? The image on the left was taken in fairly low, diffuse mid-day light in mid-January. The right hand image was taken about two weeks later in much lower light, approaching dusk. I observed the same bird again once more, in better light a week or so after that, which allowed me to conclude a couple of things. The bird's yellowish primary fringes had actually faded a bit since I had first seen it, so this discrepancy between these images had at least a partially natural explanation. The large white balance correction required for late evening light may also have been a factor affecting colours in the right hand image. Lastly, I believe the level of ISO amplification needed to form an image from such low intensity light meant that there was surely a loss of colour fidelity, including an impact on colour saturation. So, this is an example of both natural and unnatural, artefact-driven colour desaturation at work. Perhaps the most interesting revelation from these recent experiences with colour is that forensic tools like saturation boost may actually help uncover some hidden colour traits that we may not currently be aware of, simply because our eyes are not tuned to them. I wonder if the subtly coloured fringes of that rare bird are actually a common but little observed trait which may become more apparent through the forensic analysis of photographs. Indeed, perhaps there are similar 'cryptic field marks' waiting to be discovered.